The New Jersey Casino Control Commission have now issued their first batch of online gambling site licenses to a lot of gambling sites and as such if you fancy having a gamble online then there are plenty of sites to choose from. However it has to be noted that the first batch of gambling licensed issues were primarily for casino and poker sites, and as such at this current moment in time they have not issued any online gambling licenses for online bingo sites! It is to be expected that in the coming year the New Jersey Casino Control Commission may take a look at legalising and regulating online bingo sites, for many of the online gambling platforms that have been given the green light and now hold full gambling permits have also released to other jurisdictions a large range of bingo games, so it would be a natural progression for the licensing authority in New Jersey to add these bingo sites to their currently licensed casino and poker sites. To give you some ideas in regards to the many different types of bingo games that we would expect to shortly become licensed for bingo players in the New Jersey State boundaries, below we have highlighted those online bingo games which are available in other jurisdictions. 90 Ball Bingo Games – The 90 Ball Bingo games are the most played games online, and the reason why there are a huge number of bingo players flocking to play these types of games is that there are three different prizes that can be won when playing this bingo game variant. This quite easy to play bingo game is played on a single card, however players can of course purchase as many of them as they so desire, and on this card there are three lines of numbers and on each line there are 5 different numbers from one to ninety printed upon them. The three different prizes players play for on 90 Ball Bingo is a one line game, then a two line game and then once these two games have been played and someone has won each game then the full house game is played, and the player getting all fifteen numbers marked off on any single card they bought will win the jackpot for that game. 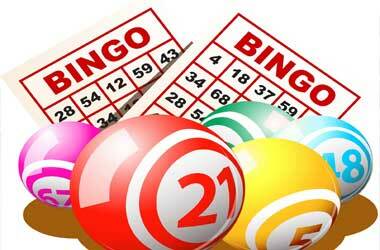 75 Ball Bingo Games – The 75 Ball Bingo games are played on a completely different bingo card to the game above this game used a grid formation with 5 rows of numbers spread over five columns of numbers. The middle number of each grid is usually a free position and is marked off without the need to get a number called out of the bingo machine. There are hundreds if not thousands of different bingo playing patterns attached to these types of bingo games, and they are therefore quite fun to play bingo games. 80 Ball Bingo Games – Finally you will also find the game of 80 Ball Bingo offered at a lot of online bingo sites, now this particular game is played on a slightly smaller grid than the above game with four rows of numbers and four columns of numbers, so 16 numbers only are printed on each card. The usual playing patterns a player will be playing for on 80 Ball Bingo games is a line in any direction across the board or getting all four corners called out before any other player. The main attraction to players of 80 Ball Bingo is that the games are played rapidly, and as such you really can play much more of these types of bingo games per session than you can when playing either of the two above named bingo games. The stakes and prizes offered on this and in fact all other bingo games will of course depend on just which bingo room you are accessing!